The chief nuclear envoys of South Korea and China on Monday discussed the issue of declaring a formal end to the Korean War. 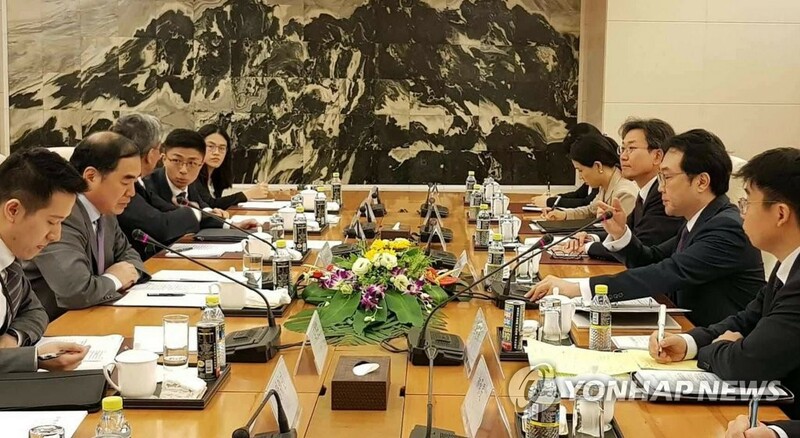 Lee Do-hoon, special representative for Korean Peninsula peace and security affairs, told reporters that he met with China's Vice Foreign Minister Kong Xuanyou in Beijing to discuss the progress of the declaration. Lee made the remarks at Beijing Capital International Airport, adding Kong also shared what he discussed with North Korea during his recent visit to Pyongyang. Lee said it is positive that Seoul and Beijing had a considerable consensus on Korean Peninsula issues. Asked if China is considering participating in the declaration, the Korean envoy said that Beijing is not talking about it unequivocally, but Seoul is discussing the issue with that possibility open.